Ireland: Social, Political, and Religious. Vol I. The Exploits of Fr. William Doyle, S.J. The State of Famine and Disease in Ireland. Report of the Committee of Privy Counsellors appointed to consider authorised procedures for the interrogation of persons suspected of terrorism. A Letter to the First Belfast Company of Volunteers, in the Province of Ulster. Dublin After the Six Days Insurrection. Passenger accommodation between Ireland and Liverpool – May 1849. –N. L., 4th November, 1760. These were farms, “now in the occupation of the several tenants,” openly advertised for letting over the tenants’ heads. Johnston and Bateson were middlemen, created by Donegall and traders in Belfast. –N. L., 3rd January, 1764. This was similar to the last, and an attempt by a clergyman to act unjustly to the tenants. “Any person willing to settle in the town of Killeshandra and county of Cavan may apply by letter to Richard Jackson, at Torkel Lodge, near Dundalk, naming the tenement and parcel of land he wants, with the rent for each; and all others, whether resident or not, who chuse to take leases of lives or years of any part of his estate in said county, may depend upon their names being never mentioned before the leases are signed. Here was an archdeacon trying to induce strangers into Killeshandra secretly, so that a higher rent might be obtained, and the old tenantry ruthlessly evicted. Was it to be expected that the evicted ones would take such treatment lying down, even when the landlord was a high dignitary of the establishment? His apron did not cover all his sins. –N. L., August 24th, 1764. This meant wholesale evictions of the old tenants, who needs must emigrate or return “outrage” for outrage. “To be let for leases for lives, the following farms in the parish of Ralloo and county of Antrim, part of the estate of the right hon. A. Trevor. 15 farms, more than 400 acres. –N. L., 3rd September, 1765. –N. L., 12th May, 1767. We cannot trace what connection this parson had with Carnmoney, unless he was an agent (a favourite job with such characters when they had few duties of their own) for some of the middlemen. The Thompsons grabbed land at Carnmoney, and have a claim on it yet. They were allied with the Gregs. He may have been their agent. These tenants were not finally evicted. They stoutly resisted by every means, and held their own. Most of them are still represented on these identical farms, but the name of Clew- clow is unknown, and the Thompsons have galloped away. The ghost of Galloper Thompson was long a trouble and a nightmare. This was ominous news for those who held expiring leases in the town. Money must be forthcoming, let it be begged, borrowed, or stolen, to appease the wants of this absentee undertaker, to satisfy his spendthrift ways; so the larger the fine, the better the lease, and vested interests were totally disregarded. It took over one hundred years of hardship and agitation to impart some degree of equity to the Ulster land tenure. One real benefit did grow out of the evil. The giving of long leases around Belfast encouraged a trading community to grow and flourish untrammelled by the usual landlord restrictions. The townland of Ballynamullen, the townland of Bally- naleney (except David Wood’s farm); the farms in Cargin now possessed by Widow Keelen and the MacVeaghs; the townland of Carleane, in seven separate farms, being from 25 to 45 acres each farm. John MacCroddon and Valentine O’Hara’s farms in Clonkeen; the townland of Drumremond; the half townland of Killyfas, now possessed by Widow Adgar, Nicholas Brady and Daniel O’Drain; the townland of Portlee (except Robert Small’s farm). Widow Dobbin’s farm in Achilley. Now to be set in reversion, to commence from November 1768, in many separate farms, the six towns of Largy (to wit), Gortgole, Lisnahunsheon, Luan, Killyless, Drumrenkin, and Mobny. –N. L., 20th January, 1767. Nothing more shameless than this appears in the press at this time. Take it in detail. The very English language cries out blood. “Widow Keelin’s farm” and “widow Adgar’s farm” and “widow Dobbin’s farm” yes, the farms of the widows and the orphans, not Charles O’Neill’s, were to be set to “protestant tenants,” and the widows might go where God wills. “David Wood’s farm” and “Robert Small’s farm” were excepted, so we may take it they were “saved,” even from “protestant Charlie,” as he was called. To such depths of iniquity had an O’Neill sunk under the undertakers’ policy. Truly their successors in title, though not in blood, have something to wipe off the slate. –N. L., 13th January, 1767. Very cheap and “improveable,” the tenants being very solvent; and so a middleman is advertised for, who could screw them up until they would be neither good nor solvent nor improvable. “The above lands are all arable meadow and pasture and in the Barony of Upper Iveagh and parish of Kilcoo, within two miles of the town of Castlewellan. A fairly clean sweep of the tenantry was intended in Kilcoo and Ballyroney, under Thomas Read’s direction, unless the fates decreed otherwise. Of course we have other “outrages” advertised from this district, which was quite to be expected with such an inducement as this. “Whereas by an advertisement of 2nd inst., signed Melvin Johnston, all persons are forbid to treat with John Willock for the lands of Clanvarraghan, held by Dominick Macartan and his undertenants, for that said Melvin is in possession thereof, and has an undoubted right to the same; which advertisement appears to be framed by some malicious person in order to keep said lands waste. John Willock derives under Richard Johnston, of Monycarragh, who is still living, by virtue of an article obtained several years ago; and Melvill Johnston, by the advertisement called Mellvil, is a minor, not near of age, and has no title thereto, so that it is hoped no regard for the future will be paid to any advertisement which may appear under any fictitious name. On John Willock’s first advertisement appearing, said Macartan immediately quit the possession, but left therein a parcel of disorderly people, whose intention, as is supposed, to keep the possession by force, some of whom are already discovered, and will be prosecuted to the utmost rigour of the law. Mr. Willock will set 3 lives and 20 years from last November, and will receive proposals till ist of May next, when the tenants will be declared. The Macartans were evidently making a bit of a fight to held their own against Willock, who calls them a “parcel of disorderly people.” Of course they were, he having a monopoly of all the “law and order” on his side, and quite prepared to let the Macartan land on “proposals” for leases for lives and years, knowing well it was illegal for any papist to hold under such a lease. The Macartans were thus out of it again. They had lost their clan lands at the plantation, and must even now be squeezed out of their occupancy. “To be let for 21 years, from the 1st of November, 1768, the following lands in the parish of Maghrasharkin:–Several thousand acres in Tamlagh, 18 farms: Teeharony, 4 farms; Teasnagh, 8 farms; Drumcon, 10 farms; Gortarigh, 27 farms; Dreen, 10 farms; Ballydonally, 8 farms; Lisnagaver, 3 farms; Ballymaconally, 17 farms; Magherabony, 11 farms; Gortahera, 8 farms; Moneyleck, 8 farms; Granagh, 8 farms; Colemore, 7 farms. Proposals to be made to Thomas Thompson, of Greemount, who has power to let above-mentioned lands, which are Cunningham measure. The Thompsons were Belfast traders, who had a bleach green at Mucamore. They were notorious grabbers. What a clean sweep of tenantry this contemplates at Rasharkin “several thousand acres” “to be let.” The poor tenants might sail away in the brigantine Jupiter from Larne to swell the ranks of the exiled Irish in America for all the Thompsons cared. The greed of Waddell Cunningham had taken him away to Rostrevor to do middleman for a Ross, who should have been heartily ashamed of himself to so act towards his tenants, even for the base cash of a Belfast trader. Waddell Cunningham’s commercial greed forced him once to try and form a slave-owning company in Belfast, when MacCabe cursed him and his venture, and it fell through. Here were thirteen farms to be rack-rented. Little wonder there was plenty of “firing” in more senses than one. This was near Bangor, on the Ward property. Here were twelve farms declared vacant, and new protestant tenants preferred. In the whirligig of time the Jones representative is now a papist, and protestant tenants have no particular “preference,” nor is the district particularly noted for its protestantism. Lord Bangor was advertising farms to let at this time, so some of the evicted ones took to “feloniously” cutting down and carrying away trees of oak, ash, elm, and other “timber. Better cutting down trees than uprooting families. “12 farms in the townland of Balligin, parish of St. Andrew, barony of Ards and co. Down, = 104 acres 0 roods 30 perches. Proposals (in writing only) will be received, and kept secret if required, by the revd. Nicholas Hamilton, living near the lands. Mr. H. will, with pleasure, instruct the tenants “in his method of cultivating the land, in which he has acquired some skill from many experiments and carefully observing the nature of the soil, and will give every encouragement that honest industrious tenants can reasonably expect. The old tenants of these twelve farms were to be evicted, and then the revd. Nick, “will, with pleasure,” give lessons in his new ideas of cultivation, after “receiving proposals in writing,” “kept secret.” To read between these lines is very easy. 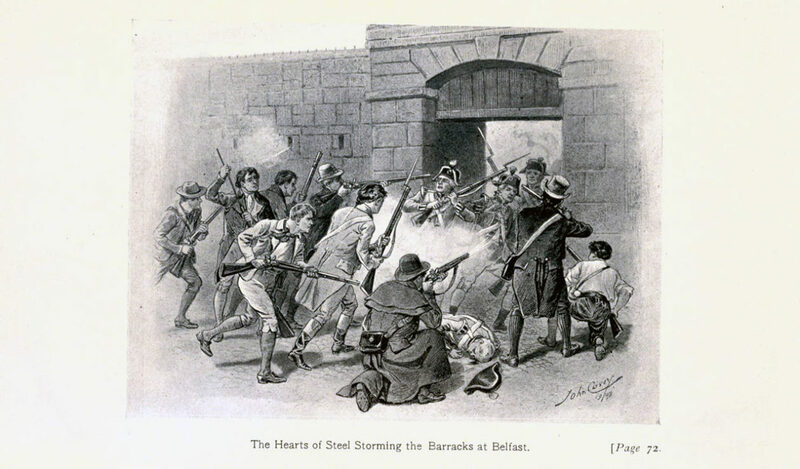 If no “proposals” were forthcoming, as often happened after the hearts of steel had made their power felt, then men like Nicholas Hamilton made the best terms they could with the rightful tenants, and so many were saved from destruction, though “the law” protected extortion–the only “protection” going. “To be set, 117 acres of land, Cunningham measure, and in great heart, part of Ballykeel and co. of Down. A good farm house and suitable offices. 15th day of June, 1771. –N. L., 21st June, 1771. These lands were in “great heart;” not so the evicted tenants. Their “Cunningham acres” were now “Waddell Cunningham” acres. “To be set, 22 farms in the townland of Clea, barony of Dufferin, and county of Down, within 2 miles of Killeleagh, 7 of Down and 12 of Belfast. Most of the farms have well-built houses, and the lands are remarkably good. 4 of these farms belong to John Gourly and contain 47 acres; 2 to William Shaw and contain 35 acres; 1 William Boyce, 17 1/2 acres; 1 Thomas M’Clelland, 14 acres; 2 John M’Kee, 25 acres; 3 James Maglbony and George Gordon, 38 acres; 3 George Cleland, 30 acres; 4 without tenants contain 35 acres. Hugh Moore, Newry, received proposals. No preference has been promised or will be given but to the best and fairest bidder. –N. L., 5th April, 1771. “To be set from the 1st of November next, for a term of years to be agreed upon, the following houses and lands situate in the townland of Ardneglass, in Grange and county of Antrim, near the navigable river Bann and in the heart of a pleasant country where the linen manufacture flourishes in the greatest degree, and near many noted market towns. Said lands are free from all tithe and church dues and plentifully supplied with firing, and so near that 20 loads may be brought home in a day. Miss Boyd and Patrick O’Doud and Patrick O’Devlin, and Darby O’Tole and Bryan O’Murry and Thomas Low were evidently going to be cleared from “the house and land where each lives,” although their people had industriously erected “good stone and lime farm houses,” which somebody now coveted and desired to dispose of to others for their own advantage. “To be sold one undivided moiety of the following lands in the barony of Kilconway and county of Antrim, etc. Part of the above lands will be out of lease in about 10 years, at which time the rent will be nearly dubled. The tenants’ rents to be nearly “dubled” in ten years–what a bait for some one. “The sale of the lands of Parkgate in the parish of Donegor, lately in the possession of John Blair, deceased, advertised to be sold on the 8th an 22nd October last by the sheriff of the county Antrim, was adjourned for want of bidders. This is to give notice that the right, title, and interest which the said John Blair, deceased, had in and to the said lands will be sold by the said sheriff at the sessions house, in Antrim, on Thursday, the 12th day of November instant, at one o’clock in the afternoon of said day. The land war had so far had effect in Donegore that bidders were not as many as the flowers in spring when “black John” was sheriff. We are quite sure Davy Douglas gave a good account of himself across the sea. It was Davy who was rescued out of the Belfast Barracks by the Templepatrick boys in 1770, where he was imprisoned for having been a bit of a leader in his time. Upton, his “landlord,” had closed around him too closely, and he must needs go and many a blessing went with him from Templepatrick. The following advertisement shows how soon the people responded to any degree of fair treatment. The tenants of Kilrea, county Derry, return thanks to their landlord and say if there were other good examples there would be an entire stop to emigration from this, which of late years has become very frequent. Ballinahone, Ballinamee, one half of Killevally, Kem, Mulletra, Gortnamoyagh, Brockeugh, one quarter of Ballytemple, Aughadowey, Ballywillen, Ballygasly, Ballinakillybegg, and Ballnakeelymore, a part of Ballybuttan, in the possession of John Orr, Ballinrees, Derrynagross, Kellykengan, Goglegorgan, and a quarter of Gortfadd, Ballydevitt, Mollan, Cuvetea, Munebrannon, Ardreaugh, Carnsallaugh, Lest bury, and Drumuan, Honeyearoy; Mullnabrone, Segarry, and half of Ballyness, in possession of the executors of Hercules Rainy; that part of Tullyramm, otherwise Killown, in possession of Miss Higanbotham, Cammus, upper and lower, the water corn mill of Ballywillan, and the mill of Killevally, both of which have a large succon bound to them, and at present are in good order. Proposals for the above lands, or any part of them, to be sent to Hercules Langford Rowley, at Summerhill, until the first of March next; immediately after the purchasers will be declared. The rent rolls to be seen in the hands of Rowley Heyland at Langford Lodge. All the above lands are situated in the county of Derry, are exceedingly well tenanted, in the heart of a remarkable manufacturing country. This was the putting up of a whole countryside for an unholy rivalry. The lands were ofthe see of Derry. The bishop at that time was Frederic Hervey, earl of Bristol, a most luxurious and licentious prelate of volunteer fame (see page 170), Hercules Langford Rowley was the agent he never hesitated to confiscate the tenants property.